Located in beautiful surroundings outside the picturesque town of Châteaulin, close to a tree-lined bend of the canalised River Aulne. The pitches are separated by hedges and flowers and are suitable for tents and campervans with awnings (not suitable for large caravans and motorhomes). Located in beautiful surroundings outside the picturesque town of Châteaulin, close to a tree-lined bend of the canalised River Aulne. The pitches are separated by hedges and flowers and are suitable for tents and campervans with awnings (not suitable for large caravans and motorhomes). Make sure you order your fresh bread and croissants each morning from the local award winning patisserie. La Pointe lies just outside the picturesque town of Châteaulin, close by a tree-lined bend of the canalised River Aulne. The site is British-owned – Marcus and Julie took over from another English couple in 2008 – but it attracts a loyal following of French campeurs, along with British and Dutch regulars, who appreciate the warm, considerate welcome, spacious pitches and good facilities. Set in a conifer-lined valley at the foot of a deciduous forest, the site was recently incorporated within the borders of the Parc Naturel Régional d’Armorique. A tinkling stream runs down one side, and the pitches, separated by hedges and flowers, sit on terraces rising up the wooded hillside. Experienced campers themselves, the owners know what their customers want – there’s a spacious play area for the kids and a chill-out room; outdoor furniture for lounging and a handy fridge-freezer. If you fancy having a BBQ, they are available for hire, and there’s a daily boulangerie delivery as well as fresh eggs and vegetables from the kitchen garden. Along with the woodland, the canal path is ideal for a walking, running, cycling or fishing (the canal is a grade-II salmon stream), but adventure-sports junkies won’t need to travel far either. To get a bird’s eye view of the Breton countryside, take a trip) to the summit of Ménez-Hom, the highest peak in the Black Mountains. At just over 1000 feet (330m) it’s no Everest, and you can actually drive almost to the top, but it offers a panorama of Western Brittany and the Crozon Peninsula like no other. The paragliders who use the peak get an even loftier view looking north towards Brest, south to Quimper, and west, where the coastline curves around the sweep of the Baie de Douarnenez with its extravagantly long, level stretches of sand. Near Douarnenez, Pentrez beach is conveniently connected to the site by bus in July and August and was home to the sand-yachting world championships recently. You can hire a sand-yacht of your own if you can handle the adrenaline thrill, while surfers who want to catch the Atlantic swell can head for Pen Hir Point. However slower-motion adrenaline junkies will find pleasure here, too – Marcus and Julie are keen bird-watchers, and they recommend the rugged cliffs around Pointe du Raz and local marshland sites near Le Faou to fellow twitchers. Another essential excursion is to the remarkable medieval town of Locronan, a perfectly preserved, cobbled and car-free haven which became famous in the 14th century for making sailcloth. The sand-coloured granite houses and 15th-century church have made it a favourite location for film-makers, and it’s so reminiscent of Hardy’s Wessex that Roman Polanski’s version of Tess of the d’Urbervilles was filmed there. The town feels quite touristy in the afternoon, so it’s probably best to go on a Thursday evening, when there’s an atmospheric ‘starlit’ market during high season. In short, there’s plenty to do around La Pointe and you won’t want to leave. The visitors’ book is full of comments like ‘I only meant to stay one night and I’m still here a week later’. Which says it all, really. We are open for the 2017 season and taking bookings for our canvas tent lodge and for pitches. 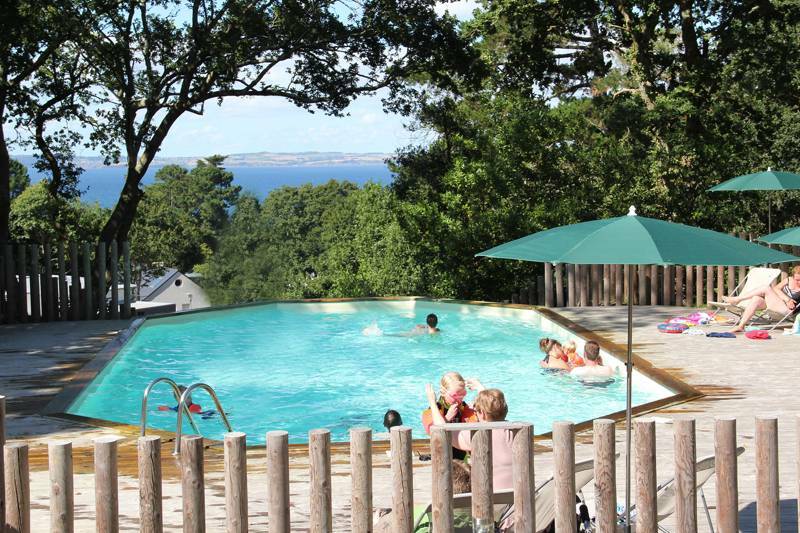 If you book a stay of 3 nights or more camping you are entitled to a discount of up to 10% off Brittany Ferries full fares. Please let us know when you reserve your pitch if you would like to take advantage of this. For latest availability and best prices for Camping de la Pointe, please use the Date Search above. 60 camping pitches most with electric hook ups. A few 'wild' pitches in the wood and on the terraces don't have electric 1 fully equipped canvas tent lodge. Campfires are allowed (but not in the forest) – please ask first. The wash-block is large enough to accommodate a much bigger site, so there are plenty of sparkling-clean sinks and showers, plus laundry wash-rooms. Next door there is an information room and book exchange; there’s free wi-fi, too. The communal room isn’t fancy, but it has a table-tennis table and space enough to relax on a rainy day when you can’t get out. 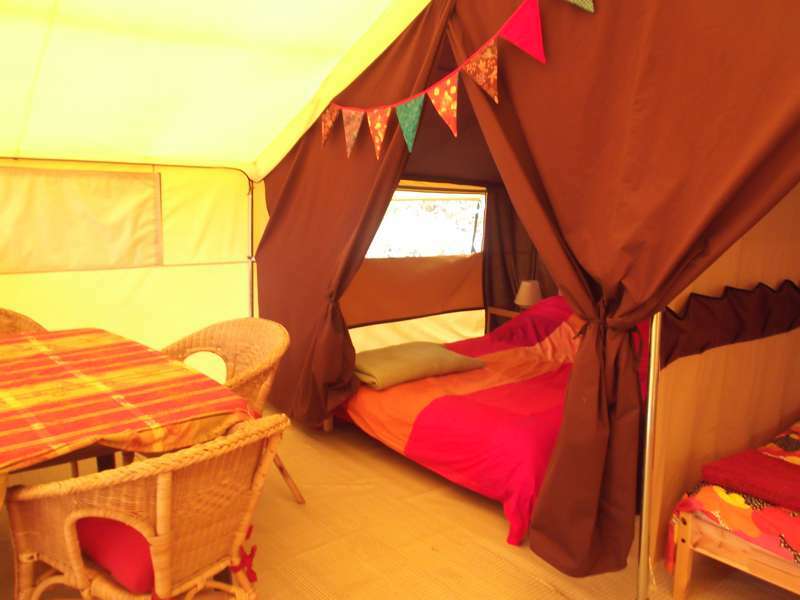 The fully-equipped tent lodge has room for up to four glampers and is situated on one of the terraces overlooking the site. Campers with their own canoes can launch just outside the campsite and bikes are available to hire. There’s a motorhome service point. Châteaulin, a stroll along the river from the site, is a lovely, floral riverside town, good for a weekly market and supermarkets, restaurants, tennis, and heated indoor swimming pool. There is a centre there that hires out kayaks, canoes and pedalos for use on the calm waters of the River Aulne, which forms part of the 200 miles (315 km) of the Brest–Nantes canal. Beaches, water sports, and sand-yachting are 10 miles (16 km) away. Quimper, the medieval capital of Finistère, is a 20-minute drive away. Brest is about 40 minutes away, and that’s where you’ll find the Océanopolis aquarium (0033 2 98 34 40 40), which isn’t cheap (adult €16.50, child €11.50), but it’s great for a family day out. There’s also an excellent open-air boat museum, Le Port-Musée, in Douarnanez (0033 2 98 92 65 20). Boulangerie deliveries mean you can guarantee your pain au chocolat for breakfast, and fresh eggs and fresh vegetables are available, too. On Thursdays in high season it’s crêpe night on site, but otherwise there are special ways to enjoy Breton crêpes close by. The Crêperie St Côme (00 33 2 98 26 55 86), on an old farm at St-Côme, near Pentrez beach, has 580 different crêpes to choose from. Marcus and Julie recommend Crêperie de l’Enclos in Pleyben (00 33 2 98 26 38 68), where they may add truffles, foie gras, peach, and other exotic gastronomic flavours, which helped earn it 2 ‘chef hats’ in the 2010 Gault & Millau guide. In Châteaulin Le Miniscule (00 33 2 98 86 28 66) is an easy-going, friendly pizza and seafood bar/restaurant, where moules frites are around €10. 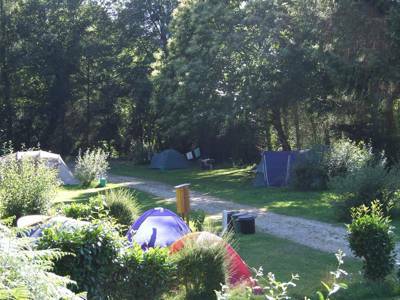 Camping, car, and 2 adults €15.50–€18 (€12-€13 on bikes). Extra adult €4. Child €2.50. Electricity €4 (prices vary depending on season). It’s about an hour’s drive from Roscoff, but if you’re coming from Rennes take N12 and then change to N164, signposted Quimper. Once you get to Châteaulin drive down to the river in the centre, cross the bridge, and follow signs to Quimper on D770. After 1⁄2 mile (1 km) turn left, signposted St-Coulitz, and the campsite is 110 yards (100 m) further, on your right.